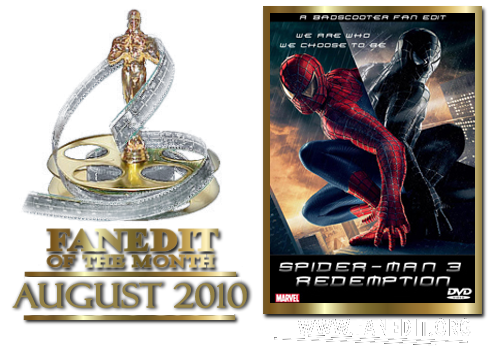 My intention was to try and make an edit of Spider-Man 3 that would stand alongside the first 2 movies and complete the trilogy on the right note. In this version Flint Marko is no longer the killer of Peter’s uncle, a lot of the humour has also been removed. Peter’s fall to the darkside is no longer brought about through guilt but through his ego and new found self importance. This version gives more focus to the journeys of Peter and Harry and how both find redemption for themselves. After witnessing the beautifully crafted Spider-Man 2 we all waited with bated breath for the 2007 release of Spider-Man 3. The trailers and posters promised so much but on its release we saw a movie that just couldn’t live up to the hype. Studio & director couldn’t agree and production was fraught with scripting & scheduling problems. The final film felt rushed with too many villains and inter connecting stories all fighting for screen time. Fans felt cheated in the handling of characters & classic storylines. 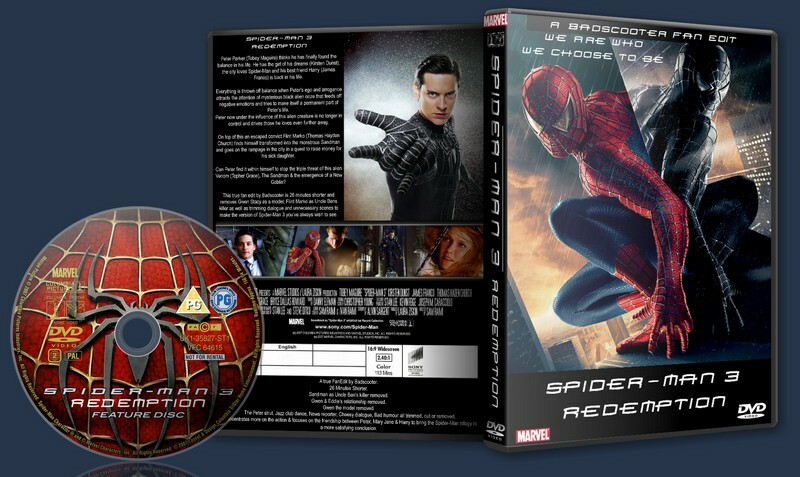 Now there is Spider-Man 3 Redemption. A true fan edit that finds a tighter movie with villains moved to supporting roles to allow the Peter/Harry story to reach its deserved finale. - Changed the opening scene, removed the Peter monologue, The Broadway musical & Harry taking the performance enhancers has been moved to later. - Sandman is no longer Uncle Ben’s killer. I have removed all elements of this from the movie. - Gwen Stacy is no longer a model. All references to this have been removed. It’s hard enough to believe the Peter is dating one model/actress without adding another to the story.Gwen remains now as as an unintentional antagonist to Mary Jane. - Harry now helps Peter through his own free will; he no longer needs the butler to explain about Norman’s death. 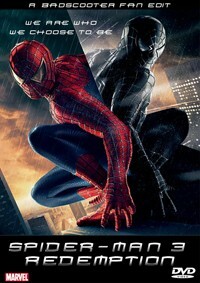 - The symbiote attaches it self to Peter when he is vulnerable after the disaster of his proposal to Mary Jane. His guilt over killing the man he thought responsible for Ben’s death no longer plays a part. - I have removed a lot of the humour which I felt didn’t work such as the Peter strut & JJ’s desk. - The Jazz club scene is also shorter removing most of the dance. - The news reporter and all the scenes with kids have been trimmed or removed as I felt there was over kill in the original cut. - I have also cut lines of dialogue I felt unnecessary or cheesy, some I couldn’t remove due to it causing problems with the tone of other lines delivery or musical cues sounding out of place. Leaving these lines in shouldn’t cause too many problems. Sam Raimi is a filmmaker who has my deepest empathy, as his great films show true passion and potential. This makes it all the worse when his bad films have constantly been ruined by studio interference, when being given creative control would have made them great. Thanks to Badscooter, we have a version of this film that is actually the version Sam Raimi intended to make. What he has done is focus the thematic arc of the film, removing any elements that distracted the viewer from focussing on the elements Sam Raimi wanted us to pay attention to. Little things stick out here and there as subtly profound visual arcs that I completely missed the first time because the other unrelated arcs distracted me from being able to see it; for instance, Harry and Peter's first dialogue scene in the film mirrors their last, with Peter standing over Harry to cut between a low and high angle shot. By having both their first and last conversations as friends visualized the same way, the viewer reflects on everything that has transpired in the evolution of their friendship between those two scenes. They are able to serve as bookends; the visual similarity signals the beginning scene and end scene to the arc of their friendship. PROFOUND THINGS LIKE THIS ARE SO MUCH MORE CLEAR IN THIS VERSION OF THE FILM!!! It is truly a well guided thematic arc, refocussing the viewer on what the film is truly about: the horrible things people are willing to do for love, and how those actions evolve into destruction. Every relationship based in love causes the character in question to do horrible things in the name of that love. It evolves into the consequencial flames of the final act of the film, which now has a clearer purpose than when all the subplots that weren't building to it were there. I really wish I could say I enjoyed this. Don't get me wrong, this is probably the best version of this movie we'll see given the material available - but therein lies the problem. Spider-Man 3 is a mess. And on top of being a mess, it's a dour film that ends this trilogy on a sour note. Which has nothing to do with the edit of course. I loved it when I first saw it some time ago. But upon rewatch, after working my way through the first two films (SM2 is one of my favorite movies), it leaves a lot to be desired. Which makes badscooter's accomplishment all the more amazing, really. badscooter has been able to deftly cut so much of the cringeworthy nonsense that dragged this movie down - Sandman as Ben's killer, Harry's butler reveal, jazz club, etc. And badscooter does wonders at refocussing the film on Harry/MJ/Peter. Unfortunately, this film's problems are too deeply rooted for even a talented film editor to fix. The copy I downloaded didnt have the greatest video quality but as I watched it that soon became insignificant. The removal of Sandmans "Uncle ben plot" worked brilliantly and a lack of personal stake in Sandman made Peters venom transformation all the more dark. All the characters were improved as much as they could be while keeping the plot and cast (I'm looking at you Topher Grace) intact. Spiderman 3 was never an AWFUL movie but its lost potential made it unenjoyable this earns it the qualification of a movie I can ENJOY. Thank you for this edit, Badscooter. It's a huge improvement over the original version. I recommend this edit to anyone who enjoyed certain elements of Spider-Man 3, but was turned off by its overall goofiness and lame subplots. I love that Sandman doesn't have a personal connection to Peter anymore (the scene where black-suit Spider-Man angrily goes after Sandman and 'kills' him, now comes across as a jealous and ego-inflated Spider-Man going after the guy who beat him in an earlier fight, rather than going after the man who killed his uncle. This actually makes Peter's descent with the symbiote seem much much darker). I also like that some of Gwen Stacy's stuff was cut out. Her character wasn't done well in this series. With this edit, I found myself sympathizing with Harry and MJ A LOT more. And of course, the greatest thing about this edit is that there's no ridiculous montage of Peter being 'bad'. I thought all the editing was great, and I like the image of MJ that flashed as Peter was in bed and about to be taken by the symbiote. I would have removed the images of Ben Parker though since they seemed to come out of nowhere. I like the small edits here and there of removing silly one-liner humour...it helped keep me engaged in the drama and action. And the only thing in this edit that still significantly bothered me was how Peter sort of danced along with the marching band at the ceremony to give Spider-Man the key to the city. Overall, a great edit that turned an unwatchable movie into a very watchable one. Not bad. Spider-Man 3 is terrible, and some stuff I hate are still here (AMNESIA!!!) plus the quality of the edit is... Ehh, it's okay I guess. It's a pretty fun edit though, and I loved what Badscooter has done in some parts. Much better than the theatrical version.